As seen in the November 2012 HauteDoll issue of Dolls magazine. One of a kind dolls by Laurie Everton. ” Cora – Queen of Hearts “. This is a pretty special ooak doll as it took two artists quite awhile to make (more time than usual was spent on both doll and outfit) I did the repaint, hair, and mask. Talented Aysun Kuzey (of KuzeyCreations) created her gown, crown, and jewelry. Starting with my part: Preparing for her repaint, I first carefully removed all of her old facepaint as I do all my repaints. I then did a bit of resculpting (eyes, upper lips, nose – adding to and taking from) For the repaint, I use quality acrylic paints (Golden) and all paint has been sealed with artist sealer for permanence and protection. She has a significant amount of detailed shading with acrylics and pastels to give her a more realistic look. Her hair has been restyled to look like the Queens hair (brought up into an updo on top, boil perm for her curls – secured and spritzed to hold) Her mask is made of 3 different materials. Epoxy sculpt for the black handle and gold mask, worbla for the red and black heart, and felt for the smaller black butterfly mask. It has been painted and sealed, with added gold beads and red crystals. Aysun Kuzey created her crown and jewelry (all by hand) She also made her elaborate gown. Details from Aysun about the dress include: The dress has three layers of skirt – starting with black organza with a black lace border on the hem. Then the white one (with about 1000 pearls on it) made of wild silk – then the red one which is attached to the bodice – it´s made from satin. On the red one is silver lace border and black satin bias. The cuffs are again the white wild silk with black lace border and heart shaped red beads with small white pearls. The collar is also made from the white wild silk, also with beads on it and black satin bias – and the bodice of the dress is lined with the white wild silk as well. Also included with the outfit: black hose, and red and black lace up boots. She will arrive with everything pictured (plus original Tonner box, stand, and certificate of authenticity) If your a Once Upon a Time fan or Barbara Hershey fan, you will not want to miss out on this very special ooak. There will not be another like it! I have been repainting dolls since 2000 and focusing on portrait repaints the last 10 years. Before dolls, and as far back as a preteen…. Ive been doing portraits (which is what Ive always loved to do) starting to draw celebrities like Bette Davis and Elizabeth Montgomery from my dads Hollywood books. Pencil and pen used to be my medium, now its acrylics. My canvas used to be paper, now it is dolls (which I do love and also collect) I do still draw portraits when time permits, but repainting dolls will also be a part of my life (for as long as im physically able :o). All my dolls come with a certificate of authenticity. All my dolls come from a smoke free home. For more information about me and my dolls, you can find “the Barbie Canvas” on facebook and “Laurie Everton” on Twitter and Instagram :o. I usually will get back to you the same day. Thanks for looking, Laurie. 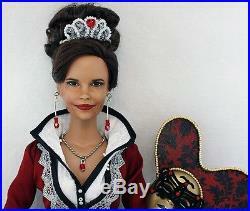 The item “Barbara Hershey as Cora Queen of Hearts OUAT OOAK portrait repaint and outfit” is in sale since Monday, January 23, 2017. This item is in the category “Dolls & Bears\Dolls\By Brand, Company, Character\Tonner\Other Tonner Dolls”. The seller is “the_barbie_canvas” and is located in Statesville, North Carolina. This item can be shipped worldwide.